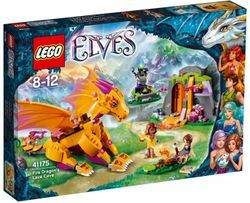 41175 Fire Dragon's Lava Cave is an Elves set released in 2016. Have a campfire at the Lava Cave with Zonya the fire dragon! Join Emily Jones and Azari Firedancer the fire elf, as they explore the Lava Cave! Meet Zonya the fire dragon, then enter the Lava Cave with the use of Azari’s magic fire powers. Discover the secret map and roast a marshmallow around the campfire. Spend the night tucked into the warm and cozy moss beds in the cave, and in the morning join Emily and Azari on Zonya’s back for an epic flight! Includes Emily Jones and Azari Firedancer mini-doll figures, plus Zonya the fire dragon. Features the Lava Cave, with a sliding function to move the lava fall aside, moss beds and a campfire. Includes the Shadow Fountain with a sliding function to transform the fountain from green poisoned water to blue clean water. Clean up Shadow Fountain so Zonya can drink from it once again. Help Azari open the Lava Cave using the sliding function to move the lava fall to the side. Set up camp, build a fire and roast a marshmallow. Fly off on Zonya with Emily and Azari for more adventures. Accessory elements include a map, cherries, campfire, evil mask and a marshmallow on a stick. Zonya the fire dragon stands over 5” (13cm) tall and 11” (28cm) long, with a wingspan of over 12” (33cm) wide. The Lava Cave measures over 3” (9cm) high, 6” (16cm) wide and 3” (8cm) deep. Facts about "41175 Fire Dragon's Lava Cave"
This page was last edited on 21 January 2018, at 19:30.